Without the help of others, Kathryn Meier wouldn't be where she is today. As a result, she works every day to pay it forward by supporting future generations of scientists and innovators. Not all high school students want to spend their summer in a lab working with slime mold. But for Kathryn Meier, now the associate dean for graduate education in the Washington State University College of Pharmacy, it was a dream come true. Unbeknownst to her at the time, it was also the first step to becoming a scientist, mentor, and advocate. It was her mother who got her on the right track. Meier’s mother had always encouraged her to pursue her passions and recognized her daughter’s knack for science, Meier says. The oldest of nine children, Meier’s mother never had the opportunity to attend college in her youth and wanted to give that opportunity to her children. With her mother’s encouragement, Meier spent a summer in high school getting a crash-course in science. It was exciting just to be there, to be surrounded by smart, motivated people, she says. Being given the opportunity to help discover new things at such a young age was, she says in no uncertain terms, addicting. After Meier graduated from high school, she went on to pursue her degree in biology at the University of California San Diego (UCSD). Not only did her summer working with slime mold get her hooked on research, it also opened even more doors. The next step in her journey took place as an undergraduate work study student in a lab at UCSD, where she found more support in her pursuit of science. Before she even graduated, Meier helped author two publications as part of her lab work—an unusual opportunity for an undergrad. She also got her first taste of pharmacology, another unusual opportunity given her class standing. After learning the basics of pharmacology and meeting some of the best pharmacologists in the world, who at the time were faculty members at UCSD, Meier went on to pursue her Ph.D. in pharmacology at the University of Wisconsin-Madison. Eventually, she ended up working as a professor for the WSU Department of Pharmaceutical Sciences. When the College of Pharmacy moved its operations from the Pullman campus to the WSU Spokane campus a few years ago, Meier added the role of associate dean of graduate education to her teaching duties. 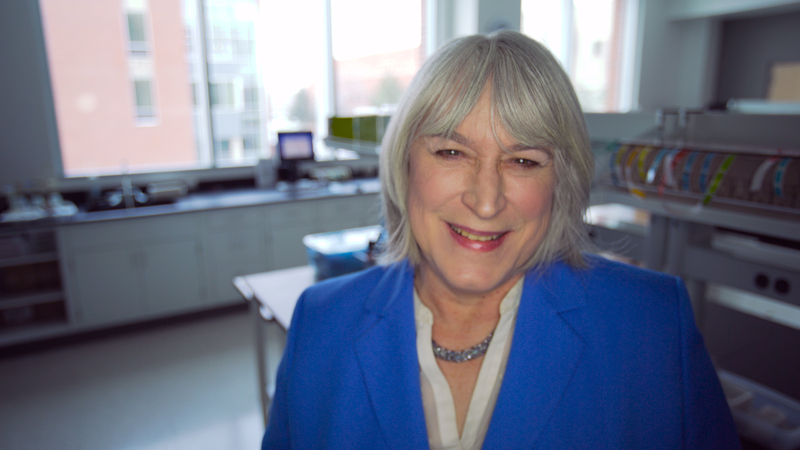 Nowadays, Meier takes the support and encouragement she received from her mother, her mentors, and her professors, and passes it on to the next generation of scientists. She works with students who know what path they would like to take and sometimes with students who, like her high school self, aren’t sure where exactly they’d like to go. All they know is that they enjoy science. Although Meier didn’t initially set out to pursue a career in pharmacology, she is a living, breathing example of how encouragement can put a student on the right path. A summer in a Southern California lab working with slime mold put one person on the path to a career that is changing the world. Something was a little off. Previous studies on the link between omega-3 fatty acids and prostate cancer were inconsistent. Some said it encouraged growth in cancer cells, others said the opposite. Meier knew there had to be something missing. Curious at heart, Meier couldn’t be satisfied until she understood what fatty acids did to cancer cells. Fatty acids are lipids and Meier’s research focuses on lipids, specifically lipid signaling. Could the fatty acids be interacting with a receptor on the cell? Meier recruited her graduate students and together they tackled the mystery. What they found changed how the medical community views prostate cancer. It might seem like a small thing, discovering receptors on cancer cells, but it means researchers now understand more about how fatty acids affect cells. Future studies can now pinpoint this process, Meier explains. What’s even better is that these receptors are members of the GPCR family, which also includes the receptors targeted by antihistamines, decongestants, anti-asthma medications, and more. Most of the medications targeting GPCRs are available at any drug store. Now that scientists know about the receptors on the outside of cancer cells, the medical community is on track to create an oral drug like these, targeting omega-3 fatty acid receptors, that may help prevent prostate cancer. In the United States, 14 percent of men are diagnosed with prostate cancer in their lifetime. Meier’s discovery adds to the growing idea that these men can view this diagnosis more as a long-term illness rather than a fatal disease. “Things that used to be rapidly fatal are still sometimes fatal eventually, but people can be treated over the years and have a prolonged lifespan,” Meier says. However, Meier has simply opened the way to creating these new treatments. The United States leads the world in biomedical research, but only because it supports both public and private research. More often than not, academia discovers an idea or theory thanks to government funding, then the private sector runs with it, many times eventually bringing a new product to the marketplace. This partnership ensures that ideas can actually be transformed into new practical medical advances. Thanks to Meier’s insatiable need to know more, the world is one step closer to being able to prevent and treat cancer. There have been a lot of changes since Meier arrived at WSU in 2003. Recruited from a university in South Carolina, Meier was invited to work as a professor and chair the Department of Pharmaceutical Sciences. More than a decade later, Meier was named associate dean of graduate studies in the College of Pharmacy, which means she now oversees the Ph.D. program. Six years ago, Meier also relocated to the WSU Spokane campus. What she found when she arrived was a community that enthusiastically supported biomedical research. But, research isn’t the only thing Meier does. As the associate dean, she works with students, helping them find their footing in the field of pharmacology. As a faculty member she also continues to teach and mentor students in their work. In the classroom, Meier strives to help students grow academically, professionally, and emotionally. She not only teaches them the basics of pharmacology, she also applies her lessons to real-world issues and encourages open discussions. Shy, reserved students often leave her class more confident and outgoing when it comes to discussing science, she says. “Communication skills are useful in students’ professional careers because, again, the idea that students will only work at the bench for the rest of their lives is just not realistic,” Meier says. Although she has her own children, Meier admits that she thinks of her graduate students as her family too. Working that closely with someone for so long, getting to know them as a scientist and as a person, can create a lifelong bond, and she loves that part of her job. Call her old-fashioned, but every year she sends out holiday letters and a few of her former students are on her list, she says, smiling. It’s one of her favorite traditions. Just like a parent, Meier also feels strongly that a student must follow the path that’s right for them, despite what others say. Like her mother, Meier also has a knack for seeing a student’s aptitude and helping guide them without pushing too hard for one career path. Unfortunately, sometimes faculty members lose sight of what’s important for the students, she says. In the 90s while working at another university, Meier was mentoring her first graduate students. Although they were pursuing Ph.D.s and preparing for careers in research, some wanted to pursue non-research positions. One ended up working for an agency that contracts with the federal government to set up grant reviews and the others went on to work for the U.S. patent agency reviewing scientific work. The faculty of the College of Pharmacy are much more open minded and willing to help students, at WSU and beyond, toward whatever path they choose. The Ph.D. program the college offers is actually the only research-based Ph.D. program in Spokane, putting WSU in the unique position to train future scientists. The college also offers a doctorate in pharmacy degree, which trains students to work as pharmacists. It’s a very dedicated student that wants both degrees, but they exist, Meier points out. That’s why she helped created the dual PharmD/Ph.D. program. It was November, and Meier was headed to the mountains of North Carolina with one of her recent graduates. They were going to a meeting to present the results of their work with omega-3 fatty acids and she knew another of her previous students was going to be there. On the way to the meeting, she had an idea. The connection between Meier and her students is strong, just as it should be between a mentor and student. And despite being an established scientist, Meier still reaches out to her own mentors at UC San Diego. Looking back, without the encouragement of her mentors and the opportunity to dive head-first into science, she might not be where she is today. Back in high school, the National Science Foundation funded her first lab experience. Unfortunately, these last few years have been tough for science programs, Meier says. Finding federal funding for programs like the one Meier participated in is hard to come by. As a result, she’s made it a priority in her career to speak out about the importance of science. Outside of WSU, Meier has served on the Science Policy Committee for the American Physiological Society the past three years. The work takes her to Capitol Hill, where she works directly with legislators to find funding for research and educational programs. She can’t help train the scientists of tomorrow if there are none, she says. “All of these programs that encourage students to get into science as soon as possible are really important, whether it’s grade school or college,” she says. Once these future scientists arrive at WSU, Meier encourages them to reach out and engage future generations of researchers. All advocacy is good advocacy. Every scientist can be an advocate, even if they’ve never worked directly with the public, Meier explains. One thing she realized through her travels is that when someone asks her what she does professionally, her standard response of “I’m a professor” rarely prompted additional conversation. She assumes that’s because most people already have a notion about the nature of a professor’s duties. So Meier changed her answer to “I’m a scientist.” She can’t count the number of times someone has responded with “’Oh, my gosh, I’ve never met a scientist before,’” she says. Of course, it’s not only scientists and graduate students that can advocate for scientific support from government, Meier says. The government is run by the people, for the people, and if the public is engaged with scientific advancement it can also play a part in advocacy. “I think it’s important for everyone to push for funding. You can write letters to the editor, you can talk to your friends, you can tell them more about it,” she says. Without public support, Meier would have never found her footing in the field of science. She wouldn’t have followed her hunch and discovered the next step in cancer treatment. Without public funding, a future without cancer, prostate or otherwise, doesn’t exist. Keep learning. Keep pushing. Keep questioning. It made all the difference for Meier.